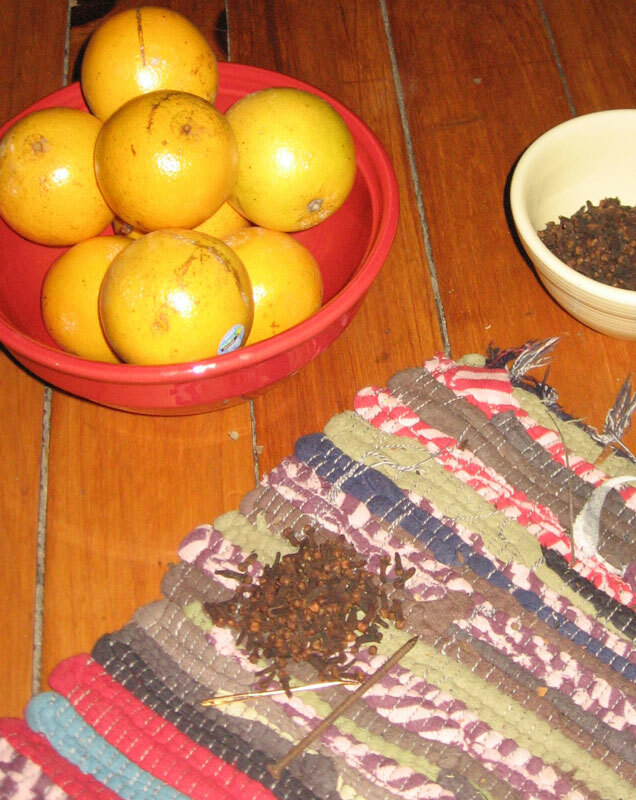 When I was little, I remember my mom sitting us down at the kitchen table with a bowl of oranges, and a bowl of cloves. 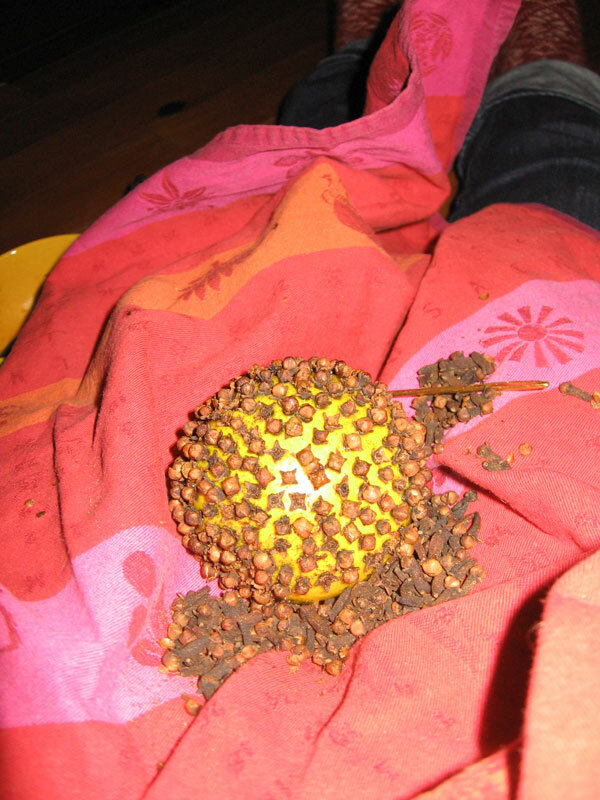 My friends Adrien and Dain were over, and we all set out to work on our pomander balls. 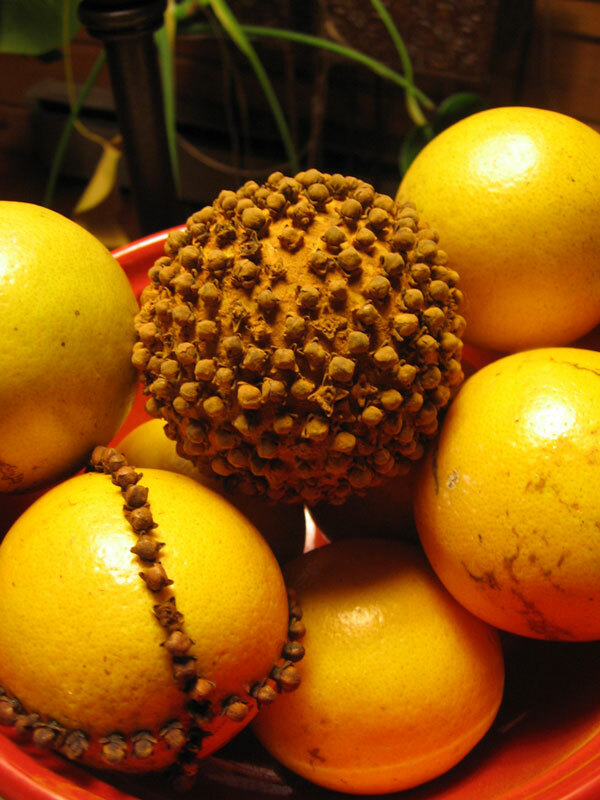 Our sort of pomander balls are made by poking holes in oranges and filling them with whole cloves, and then dusting the finished product with powdered cinnamon. The whole process smells lovely, and the result is a beautiful ball that can be used for decoration, or to keep out moths and bad smells. They are nice to keep in a dresser drawer. Step one is to poke holes in the orange with the needle. You could skip this and dig right in with the cloves, but I have found that the needle step saves your fingers a little. Step two. Place the cloves into the holes as carefully as you can. 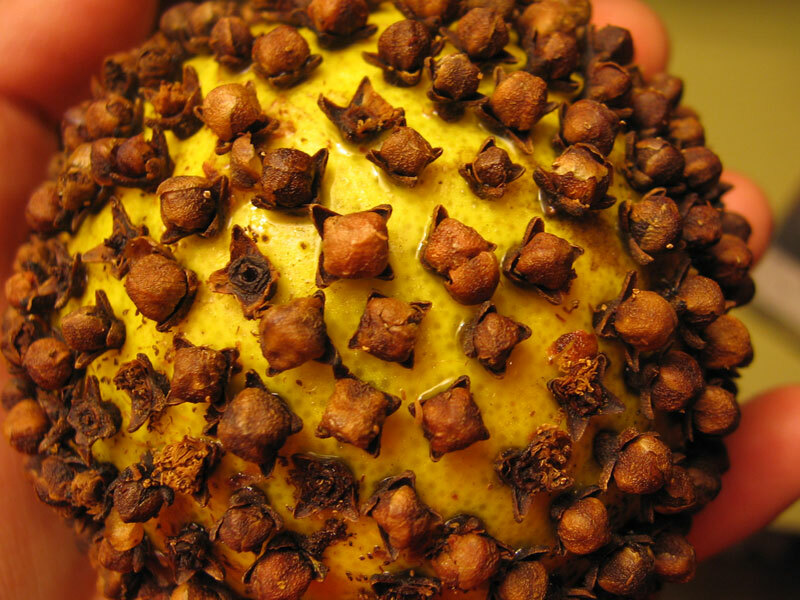 I found that some of the cloves broke easily, but most of the heads stayed on. When you have covered the orange with cloves (or have gotten fed up with the process), dust the orange with cinnamon. I dusted it lightly, and then tapped the orange gently to remove excess. The finished oranges can be decorated with ribbons tied around the middle. Leave the orange alone where the ribbon is to go (stick with cloves on either side) and then tie the ribbon around the orange after dusting with cinnamon. The oranges will dry out and remain sweet smelling for a long time. We used to make those, too. I’ve not done them since I was a girl. Forgot about it until I saw your blog, Torrey. Thanks for the trip down memory lane. I miss my mom. Wow, I just did one with apples, but they don’t stay preserved as long as the oranges, but do smell like I’m always baking in the kitchen. I used to make these when I was a little girl, excessively, until it got to a point where my mom would ask whether I was going to eat it or do crafts. Too much of a good thing, lol.Thanks for the idea about keeping the moths at bay with them. Didn’t know I could do that. Must protect stash!